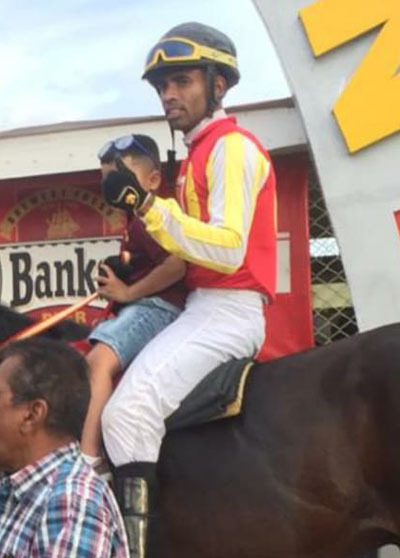 Ronald Ali of Trinidad and Tobago (T&T) will be coming to Guyana for the second leg of the Jumbo Jet Thoroughbred Racing Committee’s Triple Crown. Ali, a former champion jockey in the twin-island republic, who last won the accolade in 2017 and was runner-up in 2016, will mount ‘Vera’s Finally’ of the Jumbo Jet Racing Stables, who is undefeated at Sunday’s venue for the meet. The venue is the Rising Sun Turf Club which is located in West Coast Berbice (45 minutes from Georgetown), and over 70 entries have already been registered for Sunday’s showdown. In a release from the organisers of the event, it noted that due to the current situation of the horse racing industry deteriorating in T&T, Ali is looking to further his career in greener pastures and the experienced jockey is hoping that Guyana can continue raising their standards in the sport, as has been the case for the past few years. This Sunday’s feature race will attract a total prize purse amounting to almost $2million with the winner of that C Class and lower race pocketing $1million. The winner of the three-year-old Guyana bred race will pocket $400,000, the F Class winner; $350,000, H Class; $300,000, I Class; $250,000, J class; $230,000, K Class; $220,000, L Class; $200,000, L Class and lower; $140,000.